Stabilnist i dobrobut! Stability and prosperity! Don't you just love that Yanukovych slogan? Be my guest. Ukrayinska Pravda (Ukr), acting on a tip from Deutsche Welle (Ukr), proudly presents another report on Ukraine’s economic outlook, in a not-so-surprising sequel to the previous reports done by MB Research International and GfK (Eng). Today’s report comes from Mercer, the global leader for trusted HR and related financial advice, products and services. Puerto Rico, Argentina and Ukraine rank lowest, with projected pay increases forecast at 4.5%, 3.2% and 2.3% below inflation respectively. Oops! Does anybody know what happened to Yanukovych’s stellar 7 percent GDP growth? 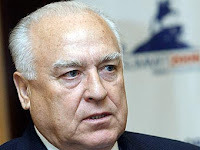 Where did the cabbage go, Mr. Azarov? Not all shoes are worn equal. An hour prior to meeting with his Russian counterpart, the Prime Minister checked on how the water was being pumped from the flooded streets of Berdyansk. Locals studied with curiosity how Yanukovych was walking through puddles in classic footwear. In contrast to his Cabinet colleagues — chief of transport Rudkovsky and head of emergency management Shufrych — the Premier did not put on resin boots. 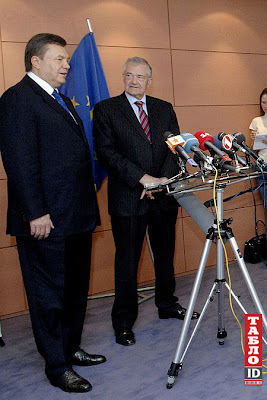 Reporter, speaking in Russian: Viktor Fiodorovich, you’re wearing shoes. How does it feel? Yanukovych: Good shoes, buddy. If you're interested, I’ll show you what shoes I’ve got on. He probably referred to a pair of these. A little too rich for a coal miner's blood, isn't it? 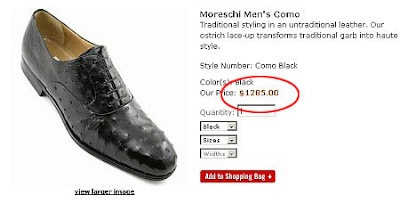 In fact, the price tag equals three months of labor in a mine like Zasyadka. Some of these videos contain minor audiovisual inconsistencies with the timeline of events. But overall, they give an accurate picture and do a good job of raising awareness. Today, Ukraine remembers the victims of the Holodomor, Stalin's genocidal famine that collectivized the breadbasket of Europe into the graveyard of 7 to 10 million Ukrainians in 1932-33. The "Light a Candle" remembrance ceremony held at the Holodomor Memorial on Mykhailvska Ploshcha (Square) was attended by thousands of Ukrainians. In memory of the victims, they lighted 33 thousand candles. Having skipped the official part of the ceremony, I made my way to Mykhailvska Ploshcha. Ukraine remembers! The Holodomor of 1932-33 was the genocide of the Ukrainian people. Light a candle in the window! On my walk back home, I checked the windows in my neighborhood and counted more than twenty candlelights. Last year, I counted less than ten. Slowly but surely Ukrainians gain awareness of their past. Slowly but surely the windows of their souls open to Soviet crimes against humanity, crimes that must be remembered and not repeated. According to Ukrayinska Pravda sources, this diverse group of conscientious objectors has reservations about the agreement. Why doesn’t this G8 hold a summit and tell their voters more about it? The first is the Russian ambassador to Ukraine. The second is the Mayor of Moscow. Ideologically, they come from the same school of thought. There was the Soviet Union, there was the famine, a great famine. And yes, Ukrainians suffered, and Russian and other nationalities, including all those who lived in Ukraine. There are so many emotions here. We don’t understand it. I don’t know who stands to gain from this and why all the emotional outbursts. So the famine in Leningrad was caused by crop failure and food supply shortages, right? The conduct of the youths who spoiled all the showcases, having drenched them with Coca-Cola, should be called complete incivility and vandalism. At the same time, should we speak about the political aspects of this exhibit, we could say that it had the purpose of disuniting and alienating the citizens of Russia and Ukraine. Certain political forces wanted to link the Holodomor to the actions of Russian authorities, but they forget that the Holodomor occurred not just in Ukraine, but also in the Povolzhye region and in Kazakhstan. What, should we blame the Holodomor in the Povolzhye region on Ukraine? It seems to me that this exhibit had one purpose: to disunite and alienate the Russian and Ukrainian peoples. But nothing will come out of their efforts; no government can alienate us. Do they keep those Auschwitz, Buchenwald, and Treblinka museums just to incite hatred between Jews and Germans? Solar radiation from the Sun and nuclear radiation from Chernobyl are natural phenomena. True or false? If true, then how about someone pisses on your head and tells you it’s raining? How would that logic grab you? 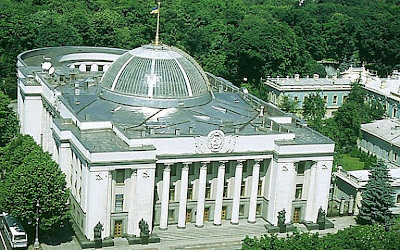 The first session of the sixth Verkhovna Rada opened today in Kyiv amid persistent rumors of an impending grand coalition, or shyrka, between the PRU and NUNS. As agreed, the opening session is presided over by MP Raisa Bohatyryova, PRU. When my friend and I came to Maidan on the morning of Monday, Nov. 22, 2004 — the day after the rigged presidential election — we saw but a few hundred people. “Damn, we’re not gonna make it,” I thought. This ghost edifice on Instytutska St. greets everyone who emerges from the upper entrance to Khreshchatyk Station. It has been standing there uncompleted and uninhabited for almost two decades. Yanukovych blows kisses against the background of a hill from which I nearly fell on Yushchenko's Inauguration Day. PRU shacks on standby, copycat style. The Blue brothers maintain a couple of ground support units in case shyrka doesn't happen.